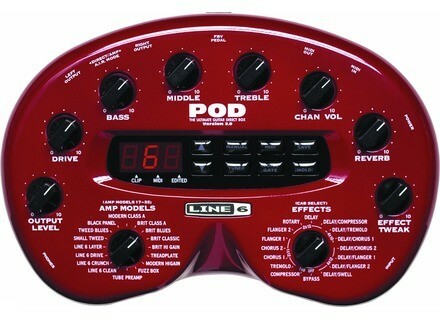 POD 2, Portable Guitar Amp Simulator from Line 6 in the POD Bean series. 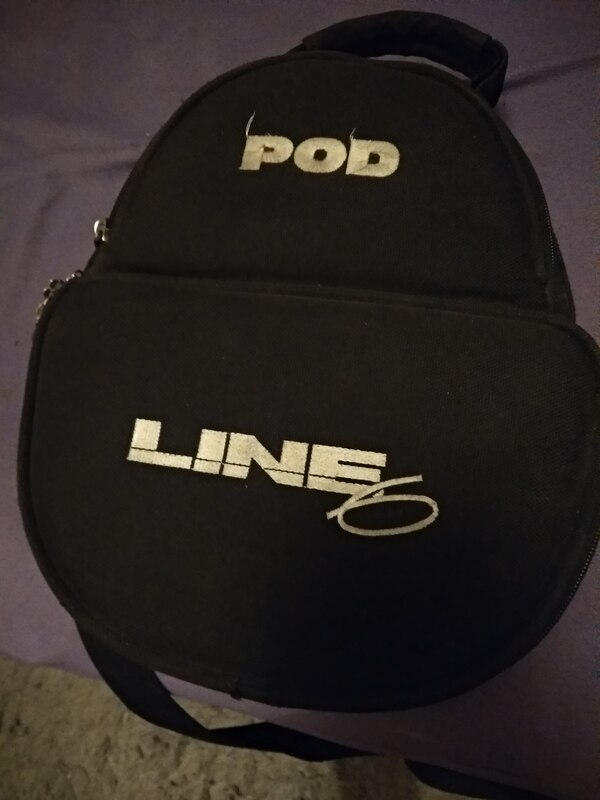 Irv Kurzbard's review"Great for gigs"
I have used my pod since 2007 for many gigs. We are a blues, classic rock band. I found the pod much easier and reliable to lug around with a medium solid state amp. No maintenance, utterly reliable and great sounds. Primarily set on a clean bassman or tweed, clean with very little distortion and reverb. The amp is set neutral and merely amplifies the pod. I am old school and was used to tube amps and pedals, but this setup is so much simpler, compact, tough and sounds fab. I have critically listened and played tube amps versus my rig. I agree that a tube amp is better. 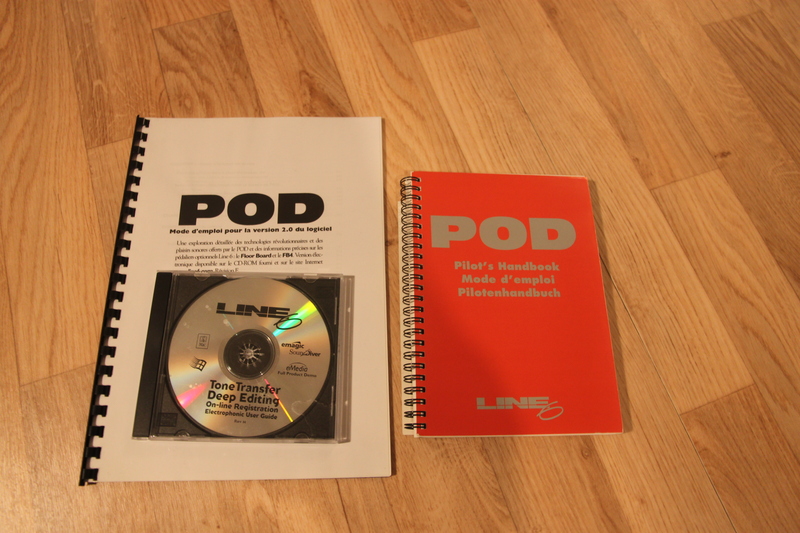 However, the pod is quite a good alternative and once setup to your liking can emulate with some of the best. Fellow musicians praise it. So do audience members. Used for about $100 coupled with a good solid state amp like a Peavey or Roland=watch out! MGR/Mario's review"Line 6 Pod 2.0"
Versatility, and true tone qualities. Endless possibilities. Rugged Aluminum body. No small parts to lose. Affordable and simple way to change your sound on stage and off. 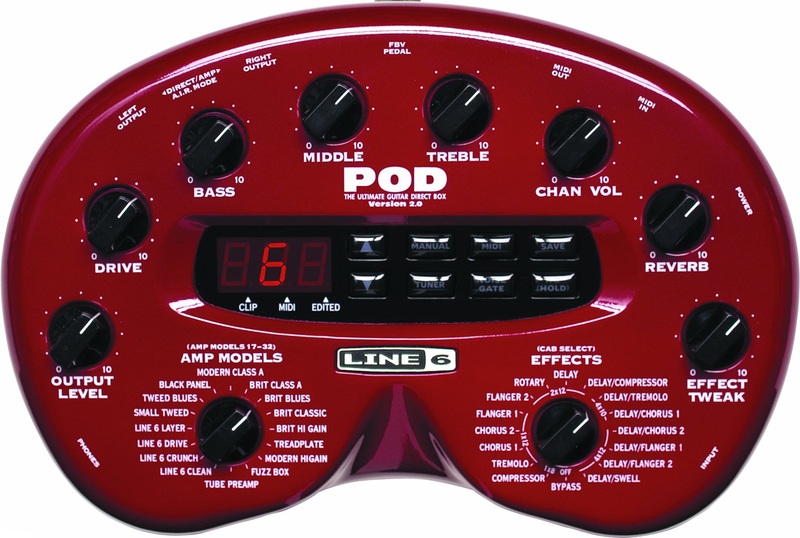 MGR/Derek Mok's review"Line 6 Pod 2.0"
Bought at Guitar Center on Sunset Blvd. in Los Angeles for around $220. Manny's across the street sold it for around $40 more, if I remember correctly. Unbelievable. No musician and producer I've met who owns this piece of gear has disliked it, and I'm no exception. Now, there's a certain quality about miking a real amp that no amount of processing can achieve with plugging a guitar direct, but the Pod will add many more dimensions to that direct sound. There is a vast array of presets and they do sound good, but I tend to switch them off in favour of the manual mode, which allows "What you see is what you get" operation. In that respect, I was able to get Stratocaster-esque tones out of a Gibson SG, a searing blues-rock wail akin to my favourite standby, the Zoom A1 setting, McGuinn-inflected electric 12-string sounds out of an Ovation 12-string's piezo pickup, a horn section emulation from an Ibanez R-series superstrat...the list goes on. This is definitely the most versatile piece of guitar effect I own, and when you count any effects stompboxes you can connect into the chain, the possibilities are unlimited. This unit also fulfills the primary reason I'd bought it in the first place -- to record loud, aggressive guitar parts without rousing the neighbours. I actually tried both the Pod 2.0 and the Pod XT at Manny's in Hollywood and I liked the older version, the 2.0, better. The XT gives you more controls and presets, but is also much bigger, more expensive (around $100 more), and harder to use intuitively. Sometimes my P-90-equipped SG actually generates *more* noise with this Pod than with my old Marshall amp. I can't figure out why since there's no sound speaker on the Pod. Some of the amp model settings are drastically quieter (I'd say too quiet) compared to the others, even with Channel Volume, Drive and Output up near 10. Though this may not be inaccurate to the qualities of the original amps modeled (and was probably an intentional design decision), I'm not a big fan of the discrepancy. The tuner setting seems erratic -- it's dead accurate with my Epiphone Dot, but my Gibson SG was definitely more out of tune than before after I'd used this tuner on it. I had to tune it by ear to improve it. Bizarre! This is also one massive piece of gear, not even including the transformer you have to use with it. 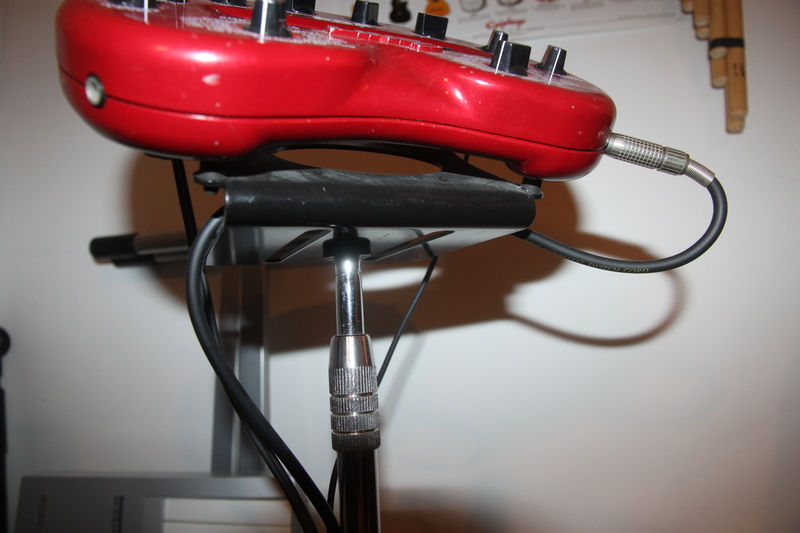 The chassis is good, though the knobs could be a little sturdier. They seem designed for ease of turning rather than longetivity. I do like this piece of gear and get great results from it, so its shortcomings are easily overlooked. It's been a defining piece of studio equipment since its inception. 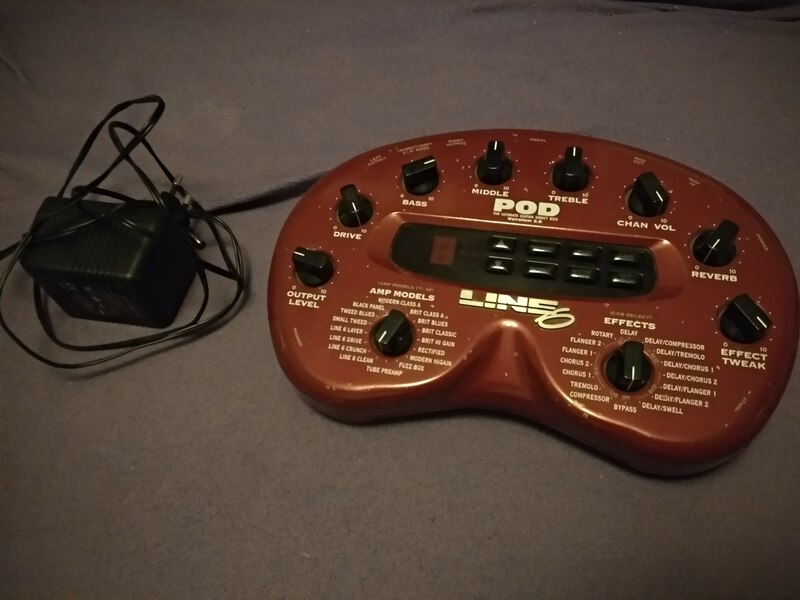 MGR/Piccolo's review"Line 6 Pod 2.0"
The pod is an amp modeling unit which can replace most if not all of your stomp boxes There are numerous preset guitar effects and a manual setting with numerous controls to tweek. This unit has dropped in price, average street price and over the net from Musician's Friend is about $249 as of November 2003, since its new big sister the Pod xt model came out. I saw it at a local musician's friend store, tried it , and liked it. I acquired it for recording direct to my 8 track. The many presets will get you started, but I obtained this effects tool mainly for recording, and it works well. The noise gate is a great addition to this pod to keep low level noise out. Although it does not have the auto wah of the new pod xt, it certainly can give you a myriad of effects on the manual setting. Manual preset information can be downloaded from the website to play the guitar parts on cover songs similar to the style used in the song. If the effects loop is raised too much along with too much reverb, sometimes some 60 cycle ac hum gets in, but it can usually be tweeked down to an acceptable level. I have used it in gig settings but unless you have done the presets to the songs you are doing, you may find it cumbersome to change the knobs manually between songs unless you are fast and know the controls well. Best used for recording ideas in my opinion and makes a great direct box with all the speaker emulations and amp combos.